"Your Mission: Get the laser beam to the rockets so they can safely return to earth! 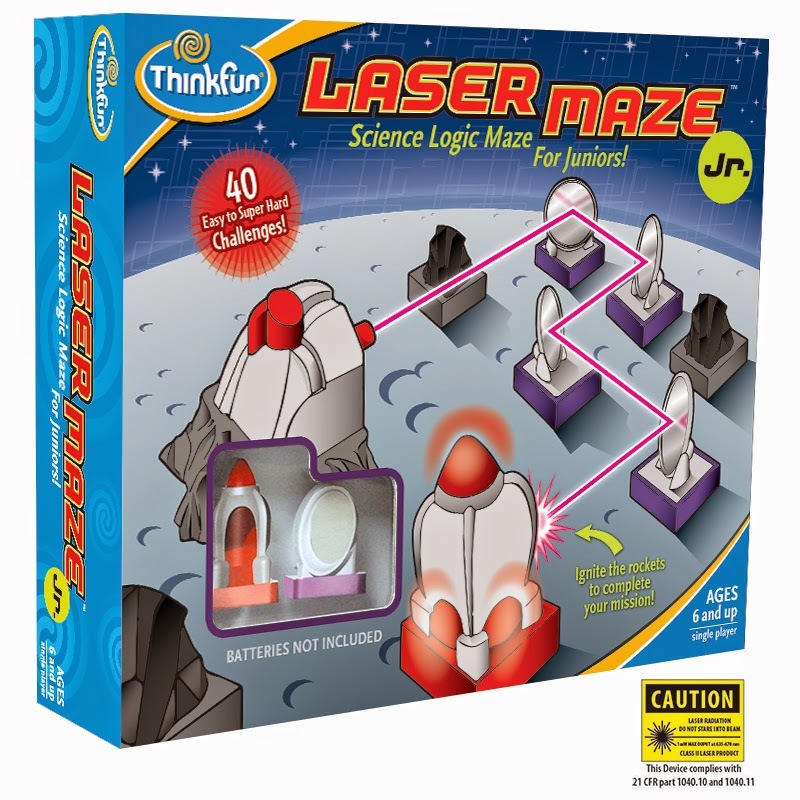 You’ll need to use science and logic to reflect the laser beam to the rockets. Carefully place the satellite mirrors to guide your path, but watch out for space rocks that might get in your way. It’s one tricky job for any scientist, but with a little brain power you’ll be sure to ignite the rockets and your mind. One mission completed and 39 more to go! " 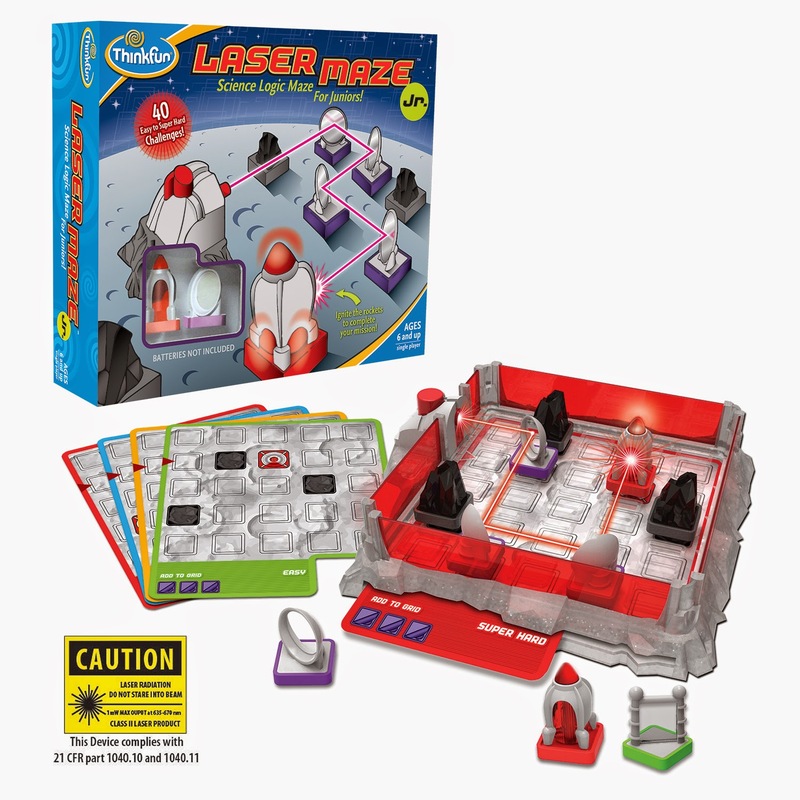 When my six year old saw the pictures on the box and read that this game is called Laser Maze, he couldn't wait to play it with me. He loves anything that involves space, rockets, and lasers too. I set it up for him, explained the directions, and then he started playing the game. I didn't really have to explain much because, like with most other games, he got the hang of it right away. you have to set up these little mirrors and sometimes little space rocks and deflectors to make sure that the laser's light hits where it's supposed to. Some only use mirrors, some use all three of the obstacles available. All cards are a bit different. It's not an extremely hard game, but there are some challenges that do take a bit of brain work. If you've read any of my other reviews, then you know how much I love having games that make you think, in my household. My son is home schooled and my husband and I find it important to have things, such as games like this one, available for him to challenge himself. He has tried several of the ThinkFun games and they all provide that necessary brain stimulation that he needs and wants. This is a really fun game, not only for him, but for my husband and I too. You can also purchase this really fun game on Amazon.